The opening of this film features a group investigating a strange and large object that is heaving out of the ice, after being buried for many years, in Iceland. Director Joe Johnston wanted a midnight sun effect on the horizon and the entire scene was taking place in a blizzard. The production had considered going to Iceland but the fact we shot this film in fall and winter didn’t help the extreme short days there. Nobody seemed to be wanting to think about this opening and so I suggested we shoot this on stage. To me, there were three basic elements needed to create a frozen plain. Skylight, the lit horizon & sun and the blizzard to blend it all. My suggestion was to build up the horizon line and put a late day glow on a white backing, use a Varilite on a dolly as the actual sun-ball seen on the horizon and track that along with our characters (to give the illusion the sun was 93,000,000 miles away instead of 100 feet). The elements were so sim ple that they were somewhat laughed-off and looked upon as though it would never work. I created a digital painting that emulated the type of light that Joe wanted and he approved that. I then did a test on a miniature set using the units I proposed and that seemed promising… But still Joe and Rick seemed extremely cautious about pulling the trigger on it. Several months passed and we were well into shooting. After some attempts to stage it outside (including an idea to shoot night-for-day as we did on our JP3 Falls Lake rig) it was decided to build the set on H Stage at Shepperton. We laid out our skylight (HMI’s bounced into Ultrabouce on the stage ceiling) our horizon glow (old fashioned cyc-strips dimmed to 20%) and our dolly mounted VL that tracked about 1/3 the distance the camera did, every time the camera moved… Even if it was only a foot or two. I must admit, without the blizzard turned-on it looked like it would never work. But with the blizzard blending these simple elements into one frame, it seemed to work fine. On the Sub-Orbital Bomber set that we see iced-over in the beginning of the film, Director Joe Johnston was quite adamant about having I very parallel beam of light blasting into the freshly cut hole and slicing through and invading the set. This was the same Sub-Orbital Bomber set that was used for the flying scenes. Different than most plane cockpits, Rick designed this set to be large and organically shaped. The set itself was on a gimbal that was 14 feet high… And the set itself was 20 feet high on top of that. We only had a 42 foot tall stage so that only left me 8 feet with which to rig this light beam. Typically, to make a beam parallel, you need to back the light off… Maybe 60 feet, and shoot it in from that great distance. If the light is too close, the beam fans out in a cone pattern and the beam is not parallel… But has the look of a light set very close to the opening. We ended up setting a 6×6 mirror up in the ozone above the stage perms, then shot in a 36 inch HMI Molebeam from 60 feet to the side of the set and reflected that light 90 degrees thru the opening at the top of the set. Being in the ozone above the perms gave stunts some space to rig their repel rigs and that crowded 8 feet of stage space became workable for us. When Joe saw the light for the first time at our pre-focus he said, “oh. I’m pleasantly surprised. I was prepared to ask you to re-rig this for a straight beam of light. You seem to have done it somehow. Ok.” Whew. I’ve had quite a few inquiries on this set up on my Instagram page, so I’d thought I’d get a little more in depth here… and also include the lighting rendering that I gave the Grip/Electric department. I’m always amazed by how the Arri Alexa accepts light. To me, it’s very different lighting with that camera as compared to film. I remember the first stage interior I shot with that camera… the crew was working on assembling the body and so I started working on lighting the set, film style, with my meter. It was a simple day interior set in a NY apartment and I had a mix of HMI and tungsten lighting units creating the look I wanted. I balanced the levels as I would with film and got the set up and together as a whole. By then, the camera crew had the Alexa together and I framed the first shot and was shocked by what I saw on the monitor. What I had lit as a soft low-key day shot looked like a horribly over-lit amateurish parody of a bad soap opera. I was completely stunned and went about eying only the monitor and making balance corrections according to the monitor image and waveform. Throw in a double here, a flag there etc. When I got the scene rebalanced, I raised my head from the monitor and could barely see anything. The levels were far lower than what I would set on film, but the image looked fine. So, I had to chalk that up to a futur e of learning about digital and the best way to transition that format into the movies that might require that medium. That said, digital cameras are a tool and a good one. Now I can plan my lighting based on the Alexa’s sensitivity… particularly in mixed light (HMI and Tungsten) situations. Case in point, a large interior space in Bulgaria where our main characters seek refuge and ultimate (and extremely creative) escape from those in pursuit. Here we have the amazing Maggie Grace and Toby Kebbell cutting silhouettes and doing a great job of showing themselves in scale with their surroundings. Placing characters in a shot like this reminds me that all the technical learning and transition to a digital world is really only background… and a gaining of familiarity with tools with which to tell a story in the best possible way. Add two amazing actors, and a talented and energetic Director and suddenly the technical distractions vanish… and I’m left with the same fun storytelling task that excites every filmmaker. Below is the lighting diagram with notes on all 4 of the Mall’s levels as well as rooftop and exterior street level lighting placements through sky lights. This rendering was also accompanied by two location visits where we walked the riggers through every light placement and hanging rig to be used. Since most of the lights were seen by camera, the hanging rigging needed to be low-key. The large central skylight will be replaced with a VFX skylight with hurricane clouds and lightning seen through clear glass. Interactive falling water on glass was created with LED projection of an image of water falling water on the windows in our production office. This was my second film with Director Simon West and he is fantastic to work with. Like many of the British Directors I’ve shot for (and a few high-end Americans) he talks only just enough about what he wants to put the thought out there… Then expects you to understand his direction and pursue that and expand upon it appropriately. Quite the presumption by the man who speaks proper English communicating to a California native who speaks the Southern California dialect of American. And Simon is quite the wordsmith and chooses his words carefully. I enjoy his ideas as he’s fantastic at planting seeds and then actually making me think I thought of this brilliant thing. Until I think back later and see that Simon was pulling the strings the entire time. It’s a very fun way to work as the director and cinematographer stay engaged through the entire production. This film starred Jason Statham in a William Goldman written script originally entitled HEAT. There was a Burt Reynolds version of this picture made around 1980 that had been re-written to death. Jason had bought the original script that Goldman had written and intended to make that film with no changes. They only changed some small things to bring it up to date and added a brawl or two, but I’d say 80% of this film is the untouched Goldman script. It was great to see Jason carry a film with his acting abilities as I have always loved his performance as an actor… even when he is engaged in one of his famous action movies. Here he plays a gambling addict living in Naked City (the blue collar working neighborhood in Vegas where all the showgirls, hookers and hotel workers lived). The main character’s goal is to win his way out of Vegas so he can leave that life behind. What can go wrong with that plan? Director Simon West is very much a film guy. The first movie I shot with him was on film and we were gearing up this production to be shot on film as well. Until we hit a snag. The lab gave me a ring about 3 weeks prior to shooting and said they would likely be shutting down somewhere around the halfway point of our schedule. I thought this was a practical joke, but sadly they were serious. Our Producers were uncomfortable with shipping film and had not the budget for that anyway, so we made the decision to change over to digital. This did not sit well with Simon who had not done a digital picture. He told me, “Use whatever camera you want… Develop your techniques… But I better not be able to tell it’s digital…. It needs to look like film. Starting with anamorphic lenses.” Ok, that said I went and started studying the Alexa 4:3 which was fairly new at the time. It looked promising until I received a summons into Simon’s office one day. He showed me a clip from a film he was researching, for art direction purposes, that was shot in digital format. “Shelly, this scene is lit extremely well, composed well, the location and art direction are spot-on. Why don’t I like it?” My take was that it was too clean. It didn’t have the kind of texture and depth within the image that film layers help to create. So, I worked for weeks with dailies colorist Bradley Greer at Kyoto Color in New Orleans, and developed grain layers, curves and diffusion techniques… Both in the camera and in the color bay, that would work together to form one whole image and recipe for this film. Simon never complained when he saw the dailies as I was baking-in all this technique into the Avid media to he could feel good about his film as he cut it. This film had a plethora of different styles… Including three fight scenes, each with a different style. One highly designed and choreographed to show the main character’s resourcefulness… One in a casino that shows his fantastic martial arts prowess in the Cory Yun style… And one very visceral and violent fight. In addition, there was the dramatic story and gambling montages that played up his addictions. Unusual angles in the casino set built in New Orleans were used to stay in his head during these moments. I felt strongly that the use of multiple cameras would convolute the dramatic story and pitched to Simon we shoot all but our action as a single camera unit. He wasn’t against the idea but didn’t know if Jason would actually prefer the use of two cameras for his scenes. He said that if I talked to Jason and he agreed, that Simon would be fine with it. A few days later (and pardon me if this gets a little crass), I’m standing in the men’s room at the urinal and in walks Jason who stands at the urinal near mine. “Shelly, Simon said you wanted to talk to me about something?” I thought to myself, Really? Am I going to pitch this single camera idea in the men’s room? So, I just started pitching while we both stood there. I got about halfway through my idea and Jason interrupted me, “Shelly, are you saying you want to shoot all my dialogue with one camera? A single camera?… Because if so, I love the idea of acting to only one camera. I don’t like performing for multiple lenses for dramatic scenes. Sold.” I can safely say that was the most productive men’s room meeting I’ve had in my career. We shot the majority of this Las Vegas based story in New Orleans… Including our Golden Gate Casino interiors. We scouted the actual Golden Gate Casino on Fremont Street in Vegas and it was amazing, but quite limited in terms of availability for film production. Our Designer, Greg Berry, proposed building the Casino as a set but ran into a speed bump when he ran the costs on the hundreds if slot machine rentals he would need. Those rentals racked into the hundreds of thousands… Amazingly. Greg then came up with a brilliant solution. In the Harrah’s Casino in downtown New Orleans, they have a very large storage floor immediately above their large Casino. It so happens this floor is full of their hundreds of stored slot machines that were all locked and under government regulation. Greg proposed building a set where the machines were stored, arrange them as needed according to his set design, then build a locking fence around the set itself, thus continuing to keep the machines in their guarded and regulated placement according to state law. It was a brilliant solution since the machines were included with location fee and the savings of machine rentals paid for most of the actual set. Greg is a very good designer and was very helpful in collaborating with me on practical placements since much if the set was to be practically lit from those sources. The place looked so good that when we returned to Las Vegas to shoot our exteriors, we were reminded just how authentic Greg’s set was. I wish I could say the bar served real martinis… But then I suppose they would have had to lock me onto the set along with the slot machines… In compliance with state regulation. I think Jason may have used my reaction to the fact our film lab was closing (thus dictating our choice to shoot digital on this project) as inspiration for this shot. Our digital path lead is to a happy place and I’m happy we were able to crack that and give Simon a film he can be proud of. This small apartment set was also but on our Harrah’s Casino storage-floor “stage”. Our crew on this film consisted of a lot of familiar faces from many films I’ve done in the south. Gaffer Bob Bates, first AC Michael Charbonnet, key grip Danny Brazen and rigging keys Wells Smith and Vic Keatly. I also had a regular Steadicam/A Camera operator from LA, Greg Smith. I like Greg because he has a real eye for a frame. He understands composition and frequently impresses me with his offers of alternating frames he may discover. Another big pilot on Pilot Day. This was my 5th collaboration with Joe Johnston and I very much enjoy shooting movies for him. We had a high-pressure start on my first film with him and I remember the day vividly when I found his funny bone and made him laugh… Somewhere around the third week of Jurassic Park 3. It’s funny because on those films you’re faced with situations where your choice is to laugh or cry… And once we could laugh together (much at my expense, granted) we had access to see solutions. Now it seems no matter what we are faced with, we understand at least one of us will work up a good plan… If not both of us. Lumen was a large pilot for DreamWorks that was shot in New Zealand. It’s about a boy who figures a way to access the world of a famous fantasy novel series and helps his family in the process. Great New Zealand gaffer Tony Blackwood really worked hard on this project. This location was remote and he had maxi brutes dotting the hillside and his crew worked very hard to get the placements I requested and power to this location. It was a set up that we got a lot of mileage from. In fact, one shot that was cut from the script was a wide shot of our group entering the camp in a remote area. At lunch time (around midnight), Joe Johnston told me he’d love to get that wide shot, and asked if there was some area within Tony’s rig several acres of lit forest that we could cheat that shot into existence. We explored during the lunch break and Joe found this tree that was wonderfully side lit and asked if I could make that work. Tony panned around some backlight and we got this shot rather quickly. Joe is great at finding the graphic element in a location or piece of action. He is art trained and knows his way around a composition and any set design. His vast ILM experience gives him quite the pedigree and he’s very exciting to work with. Tony was able to shake up a few lights that we could see and hide them behind foreground trees. We were able to walk our kids through the shot before we lost them to the child labor laws and we were happy to get the shot so quickly. I owe Tony a beer for this one. Directed by Mark Williams, this is an exceptionally well written script by Bill Dubuque. The story largely takes place in the competitive world the boiler-room office and a father who is detached from his family must find a way to connect with his son when he’s faced with illness. The son has an interest in Chicago architecture and teaches his father about appreciating the simple beautiful things that are right in front of him. Gerard Butler plays the lead roll and was very excited to star in this very delicately written piece. I always enjoy seeing an actor take a chance and work outside their safety zones. For me, I try to take the camera on a similar journey in these cases… Work outside my safety zone as well and create a united front between the director, actors and myself so that they can feel safe and supported and have some faith that the camera will be there for them when they need it. It must be tough for these actors to challenge themselves like this and I try to constantly monitor what they might be needing so that the crew can help them. In addition, first time director (but quite experienced producer) Mark Williams had an intimate understanding of the material and since the characters all go through massive changes in the telling of the story, was enormously helpful in establishing the faceted arc for the narrative. Personally, I’d swear he’s done 10 films. He’s a natural. Ultimately this film is about understanding people and how the right thing is often not the easiest thing, and I think this same idea is what we strived for in the spirit in the cinematography as well. Here’s a short frame for you. The great actor Alfred Molina eavesdrops on a telephone conversation and we wanted to really push his sense of despair, so we decided to push the anamorphic framing a bit. Interestingly, this shot was made on our first day of shooting. I think that when you push a frame like this early in the production process, you almost give the crew permission to think a bit outside the box and it fosters a spirit knowing their own suggestions can be a little more extreme. After we made this shot, I noticed Operator Michael Carella really click-in and search for opportunities where his framing would add layers to the storytelling. First AC Barrett Axford did similar things with his expressive focus-pulling that followed the meaning of the dialogue… And not necessarily the words. A film set is busy and distracting and it’s wonderful to have crew that thinks about story. In addition, our gaffer, Mike Hall and key grip Rico Emmerson were constantly finding creative solutions to technical challenges. Often when hiring a crew on location, I consider the personalities and group dynamic and try very hard to pair the right personalities with the specific project. So much of this is a gut call, since I’m often the stranger in these cases and know nothing of these people. I was very happy with how hard this crew worked on this project and helped Mark and Gerard through the process of making this film. I like working with Directors that demand a lot from their DP’s. Rob Cohen is that type. Always looking for something innovative… be it a technical operation or artistic endeavor. He’ll usually challenge himself to shoot his films with techniques that have not been done before. On our first meetings, we discussed a few unusual ideas that fall into this category. One was the use of night-for-day photography (yes you read that right) for our moody storm scenes. Since our entire film takes place during daylight hours in the middle of a giant hurricane, we had discussed the idea of shooting the entire movie night-for-day… but discarded that plan as unreasonable given our indie “little-big-film” budget. There was one sequence where the storm turns to its fever pitch in a series of scenes on our small-town-America main street. Faced with cloudless summer days and no way to block the sun to that scale on a film this size, Rob made the aggressive call to shoot that sequence night-for-day. We only had 4 days to put the lighting together and our resourceful unit production managers worked around the clock to get us the balloons and cranes we needed to execute this effect over a vast space. Plus, all my lighting had to be rigged above Elia Popov’s Category 5 hell-raiser-set-buster 100mph fans and fat goose-rounder rain. It was a crowded sky but thankfully Elia and I got along well. The sequence involved actors moving from the street, along rooftops (Toby Kebbell pictured here) and up a 60-foot radio tower. This technique allowed moving water and atmosphere to create about 80% of our finished sky. VFX will have a much easier time finishing these skies than they would have trying to paint out blue skies and inevitable hard shadows. Plus, we got the mood we wanted and put the audience in the middle of a lethal storm, the likes of which few have lived to tell about. Shot on our lighting pre-focus on the Sunday evening preceding our first days shoot on Monday. JemFX SFX cranes and stunt cranes will be added between my three came positions. Lesson learned the hard way: Get there early and claim your airspace! Our hard-working camera and grip crews and excellent balloon electrics made this sequence what it is. It was wet and uncomfortable but we got footage that could not have been made by any other means. 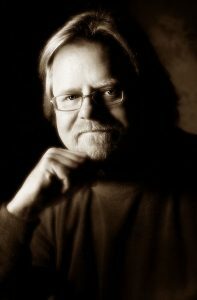 Please meet one of my key teachers, Allen Daviau, ASC. I met Allen in the late 70’s and he has been a constant presence ever since. He taught me much about the craft of cinematography with his coaching. How to be passionate about cinematography with his persona… And how to strive for artistic excellence with his images. I think we should all take a moment to thank our teachers and think about how we can extend that connection with young cinematographers. He even took a cab to Pasadena to watch one of my student films projected on an apartment wall. In this photo, Allen is paying a visit to the Jurassic Park 3 set on Stage 12 at Universal. A large-scale set lit for both day and night exterior shooting that provided a controlled environment for Stan Winston’s dinosaurs. The film was directed by the great Joe Johnston. Allen helped me enormously after I got offered JP3 and showed me the film Congo, that he shot where he had many stage-bound jungle scenes. He was very candid and honest about pointing out what he thought he did well… And where he felt he needed improvement. One of the true giants of cinematography. The Big Bang was shot in Spokane, Washington with a largely local crew. Mike Vukas was the gaffer and he worked hard at embracing our unusual visual aspirations. Peter Green was the A Camera operator and Ronnie Dennis was the First AC. We all worked hard… including doing our own rigging during lunch, so that our Director, Tony Krantz, could come away with something he truly authored. On this shot, a red nightclub, I was told that the red gel I had ordered for the windows was too expensive. So, we sent some PA’s to the party supply store in downtown Spokane and they came back with a dozen or so plastic party table cloths that we could apply to the outside of the windows in lieu of the costly gel. It made the UPM happy and sometimes that’s what tips the scales of sanity on a film set. A pretty funny 99 cent solution.